Hundreds of volunteers on Wednesday were making last-minute preparations for a traditional Thanksgiving feast at GLIDE in San Francisco. Earlier in the day Mayor Ed Lee, police Chief Bill Scott and fire Chief Joanne Hayes-White joined volunteers in serving 600 lunches as part of the organization's free daily meals program. As he’s done for decades, Rev. Cecil Williams was on hand to greet visitors, and everyone seemed to agree the lines are getting longer. 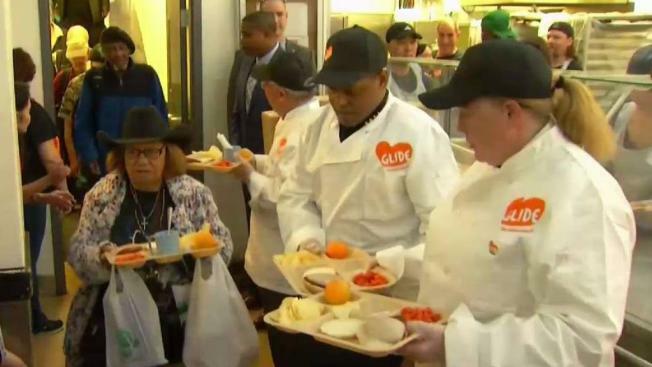 "People are more poor, they are more food insecure, and we're here to serve," GLIDE co-founder Janice Mirikitani said. "We’ve been doing this for decades, and I think love overcomes all. And I hope people can feel the love here." About 500 volunteers expect to serve about 3,000 guests during Thursday's feast.